The V510i Optimus 3D In-line AOI system is a next generation solution for the SMT line, offering the powerful 3D inspection capabilities. 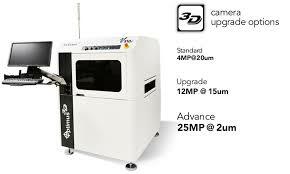 V510 Optimus 3D AOI supports mutiple input formats, for example, NDF import, SMT file import and others. The new board visualizer allows user to view the actual vector board graphic with physical dimension. Besides, the Advance Multiple Board Generation of 3D AOI allows users to create any orientations of board as well.